In a Nutshell: Pyongyang Golf Course is North Korea’s only golf course. As an avid golfer, I just had to play it. Made famous thanks to campfire stories of General Kim Jong-Il’s miracle (mythical?) score, I added an 18-hole visit to my itinerary and it turned out to be a round I’d never forget. The day ranged from inspecting a supermarket, coming within arms-reach of Marshal Kim Jong-Un’s luxury yacht, to running an impromptu North Korean golf clinic. 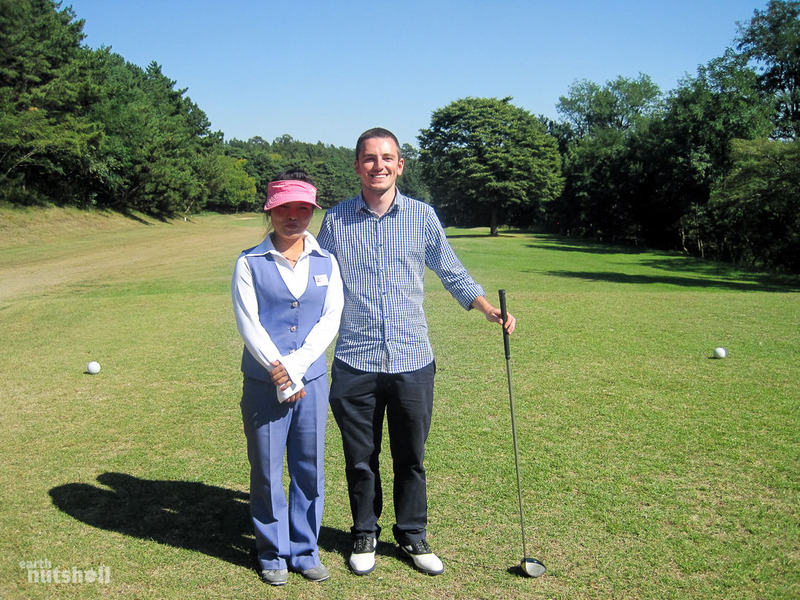 Read on for my experience at Pyongyang Golf Course! About: I’m Elliott. 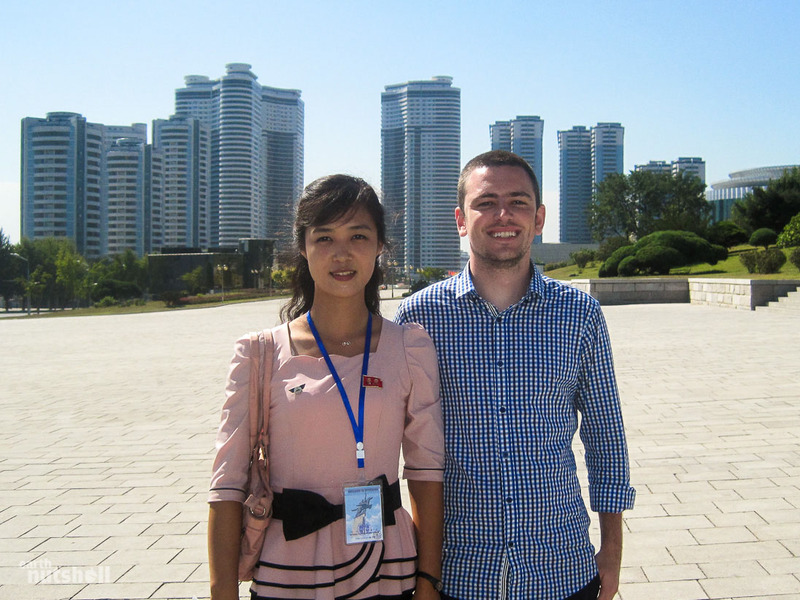 I’m the tour director at North Korea tour operator Uri Tours. I travel a lot myself, sometimes to the unusual, weird and wacky. Earth Nutshell is where I share my experiences. 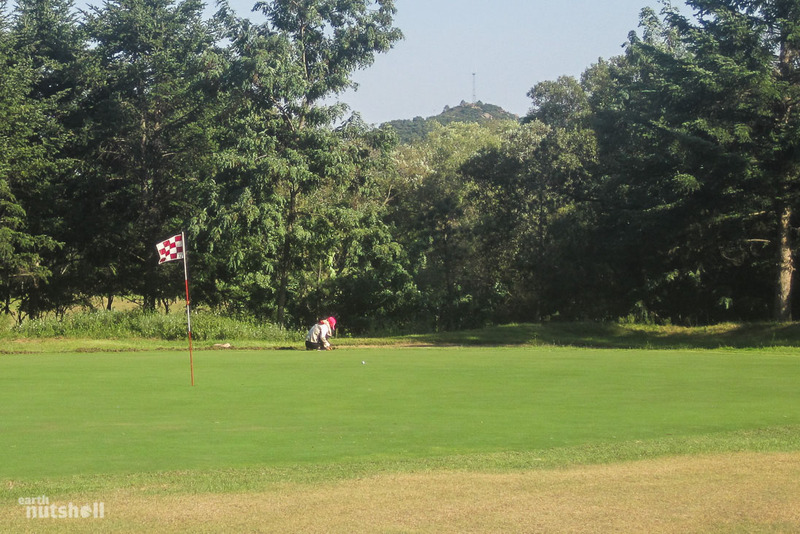 Fancy playing Pyongyang Golf Course for yourself? 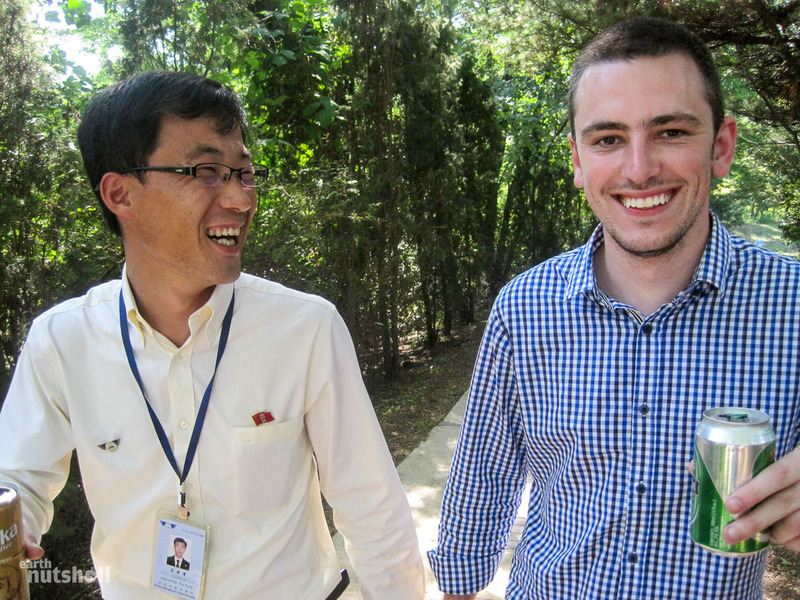 I run 3-night and 5-night private golf trips into North Korea. Shoot me an email at [email protected]. 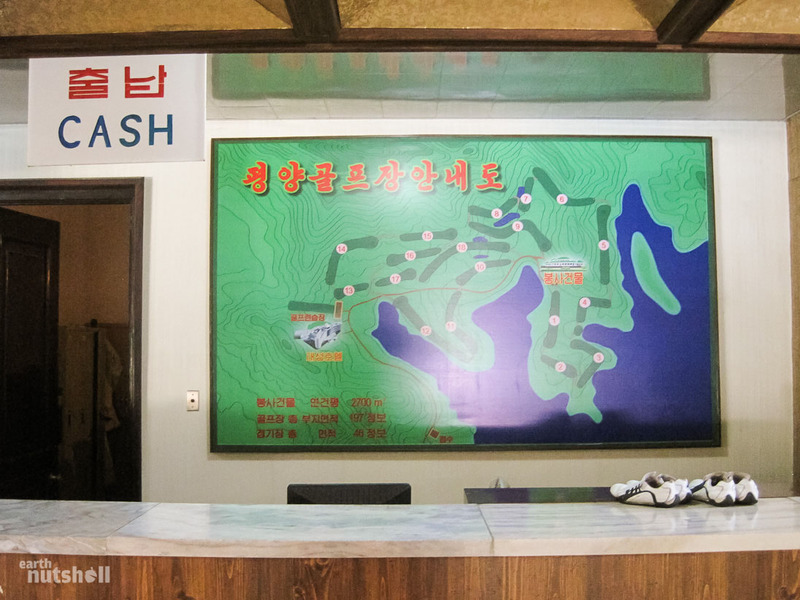 Bizarre, surreal and exclusive, Pyongyang Golf Course sits between a rock and a hard place as a morally conflicting spot of fun within an otherwise dark, oppressive nation of well publicised human rights violations. Situated across arguably the most secretive border on earth, the course is guarded by well over ten million active, reserve and paramilitary personnel and requires express permission to visit; Augusta eat your heart out. Technically a public course, you won’t find a soul here, it’s played only by a handful of the regime’s elite and open to tourists both crazy enough to find themselves in North Korea and who want to play golf. Apparently, that’s rare. 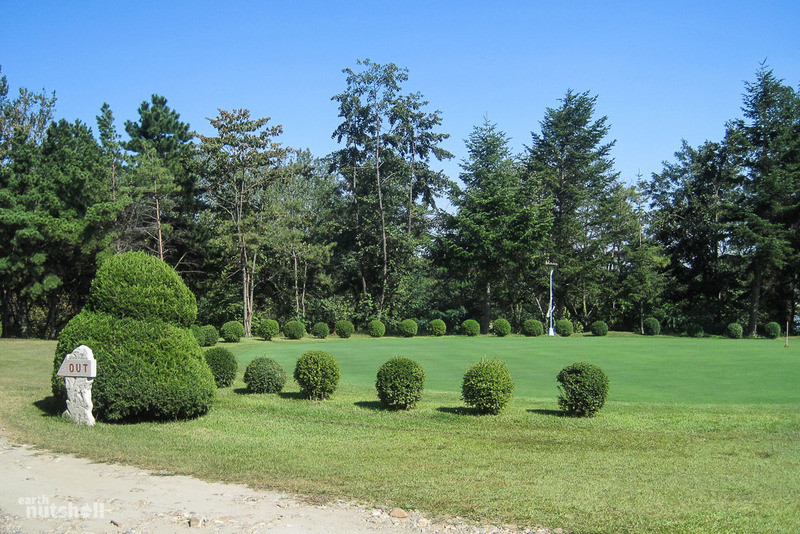 But most famously to foreigners, Pyongyang Golf Course holds an interesting place in North Korean legend. As the myth goes, it was here General Kim Jong-Il redefined golf as we know it, shattering the PGA Tour record of 59 in his first ever round with a score of just 34 strokes. 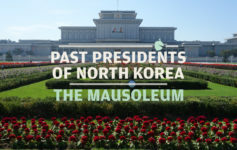 His feat is said to have been witnessed by a handful of state officials and the news shared to the people of North Korea. It even included five hole-in-ones. Was there any truth to this story? I’d find out. Golf etiquette would indicate this to be an expensive round for Dear Leader, each ace a round of beers for all in the clubhouse. Luckily for him, at last estimate, there were just 45 golfers in the entire nation. Today I’d be one of them, assuming we could find the course. Information was scant, and the guides hadn’t visited before. But, I’d been promised Pyongyang Golf Course, that it was North Korea’s only place to have a hit, and as an avid golfer, I couldn’t pass up such a unique experience. I just had to play it. So, how does one find himself playing golf in North Korea? Firstly, you must get to North Korea. Secondly, you must enjoy golf. Many of you may find this part more challenging. Organising the actual round is simple, you ask the question. It’s not a typical request and it’s usually met by a ‘maybe, we can check.’ But just four days later, the request was approved by the North Koren tourism authority and my itinerary now included an 18th of September tee-off on the world’s darkest course. Too easy. Not coincidently, today was also my last full day of this particular trip to North Korea. I hadn’t left the hotel unaccompanied in over half a month and each days itinerary had been an exhausting 8am-8pm venture. Sometimes more. I’m just saying, this countryside golf escape couldn’t have come soon enough! Perhaps I’d even get a sleep-in. 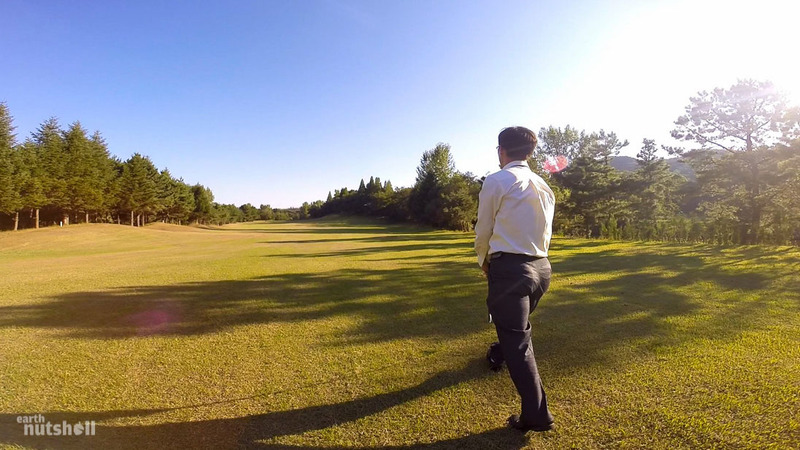 14:00 – Golf at Pyongyang Golf Course! Yes. An approved city walk (in the best part of town) between two landmarks previously visited, sanctioned evening beers and well…a supermarket. It’s not often you’ll go on a tour that showcases a nation’s toiletry and cereal selection, but there I was inspecting one of North Korea’s fully stocked ‘foodstuff’ marts, guides at my heel and stares from every direction. Nothing was plastic, and there was no fat kid with ice cream. Apparently, I was only the second foreigner ever to head inside. The backdrop is still Pyongyang if you can believe it. Modern, right? Don’t be fooled, it’s also the only block of the country that looks anything like this. It’s no surprise this formed the backdrop to my sanctioned walk. As per the itinerary, we were to eat lunch before playing golf. 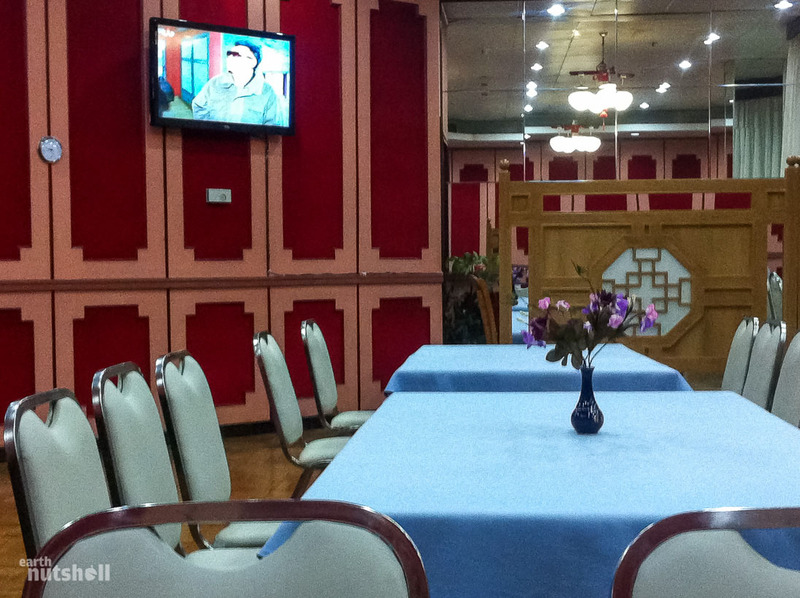 I was taken to an upmarket restaurant in Pyongyang I hadn’t yet eaten at. I have no idea of the name. I have no idea of the location. They like it that way. There was a large group of middle-aged Pyongyang residents celebrating a birthday as I walked in, most surprising as the restaurants were usually emptied prior to foreigner arrivals. Today’s meal was a treat, as an ‘important guest’ I could order anything I wanted from the menu, marking the first time I was afforded this luxury on my trip. Vegans need not apply. So…bibimbap it was. You can’t go wrong with Korean food in Korea. Even in the North. 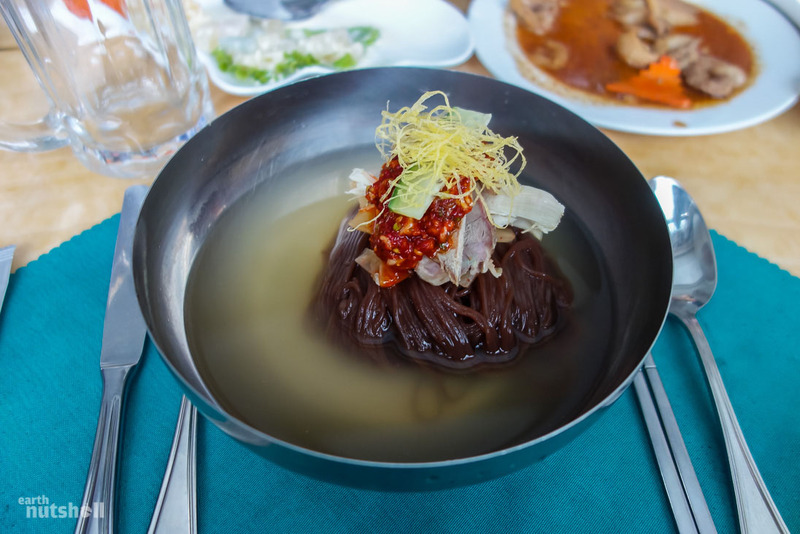 Guides ate cold Naengmyeon Noodles, a delicacy here that I thought could be better enjoyed after a quick microwave. It’s tough to get a smile out of North Koreans for photographs. 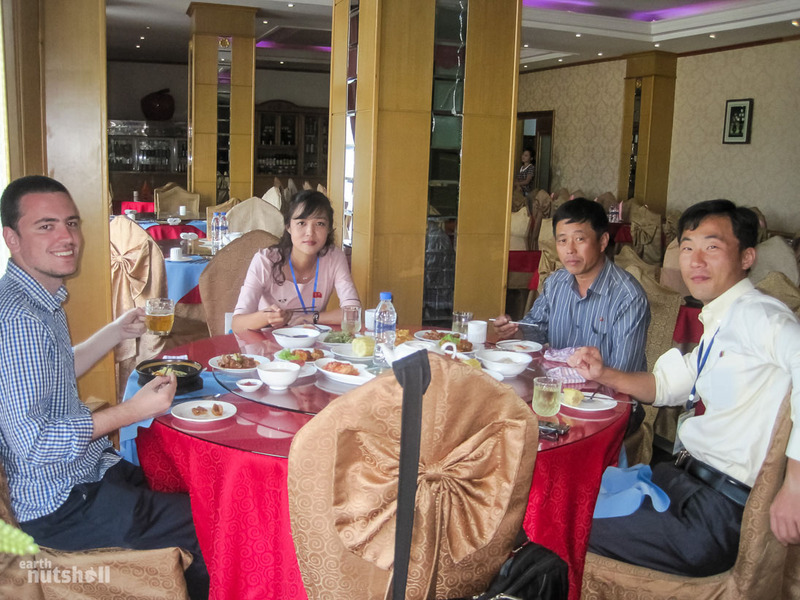 Here are the three guides and myself enjoying lunch in an unknown Pyongyang restaurant, my driver is second from the right. 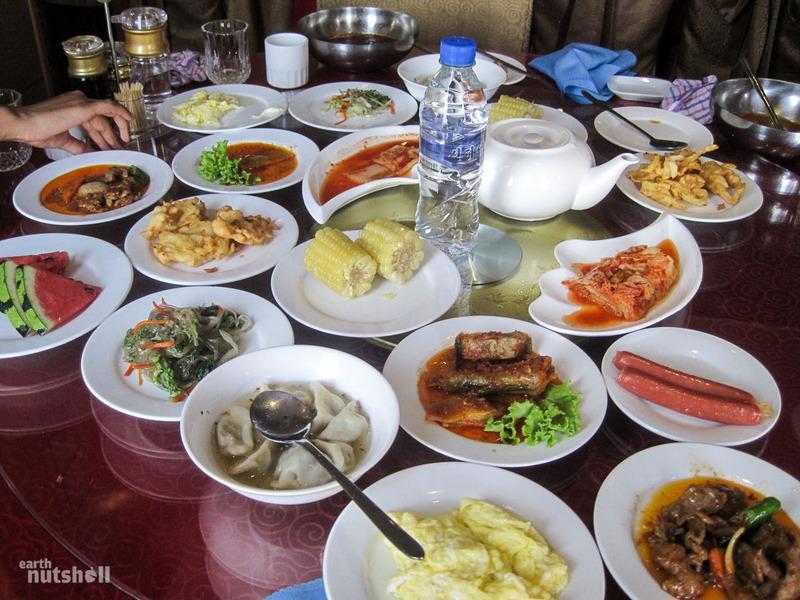 Of course, a meal in North Korea isn’t complete without a lucky dip assortment of cold meats and fried matter. Usually stale. Eating here was one of my last spins at the wheel of food poisoning, thankfully. The food, as usual, was replenished as we ate it (for foreigners at least…) resulting in massive wastage that I suspect is either recycled for further meals or consumed by employees. I know that looks like corn, but it certainly didn’t taste like corn. 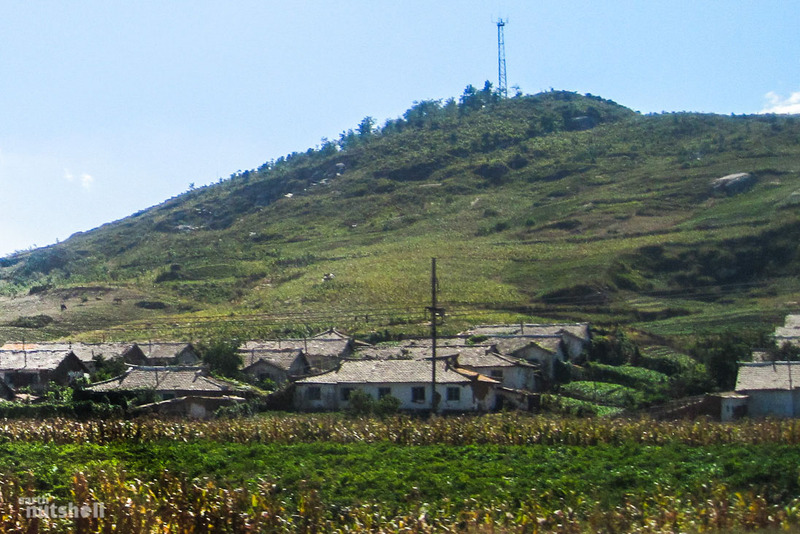 Hogging all six lanes of the unmaintained highway, we rattled out of central Pyongyang into rural North Korea, weaving between road craters. The guides and I had the van to ourselves, a locally built vehicle from Pyeonghwa Motors, curiously the only company granted advertising permission within North Korea. I had spotted their billboards earlier in my trip, oddly targeting a general populace forbidden from private car ownership. It seemed counterintuitive really until it’s motive became clear — convincing citizens of national self-reliance and the economic success of Great Korea. During our drive, laptop bouncing from knee to knee, I shared photos with Ri and Kang, the guides, from my outside world adventures. Major landmarks such as the Eiffel Tower and Times Square were immediately recognised from their studies, glaciers from Iceland left them awestruck, albeit confused, and one particular guide discovered today that Australia, is in fact, an island. Success! My transport, a Korea International Tourist Company (KITC) van. 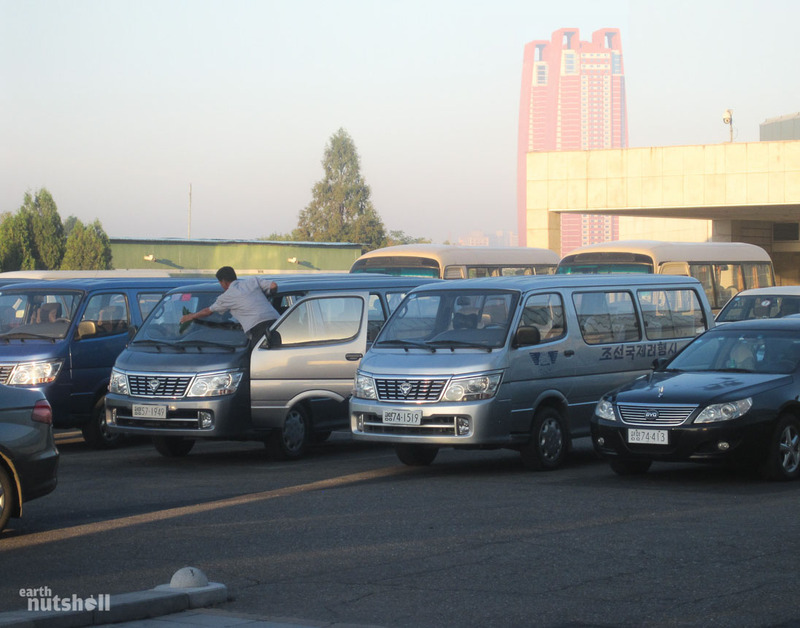 This photo was taken in the Yanggakdo Hotel carpark in Pyongyang. These are all cleared out by 9am. Out here in rural Pyongyang, the atmosphere is best described as desolate, isolated and lonely. There’s a distinct cut-off between the hazy Soviet-inspired metropolis and well, the outside. Much alike North Korean social hierarchy. Nationalistic slogans, heart-warming odes of motivation from ‘Dear Leader’ command the civilian workforce from hilltops as huge red and white banners. There are no other vehicles, just locals migrating between village and crop by foot or cycle. One elderly lady, in particular, stood out, spotted dragging half a dozen sandbags by her weathered, rusted bicycle. She was hunched over, exhausted, seemingly defeated and talking to herself, a scene I haven’t since forgotten. — Yep. We were lost. In North Korea. Lovely. 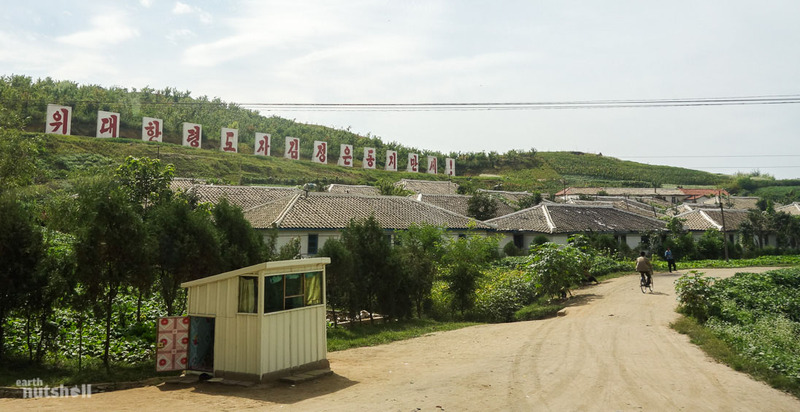 “Long live the great leader comrade Kim Jong-Un!” Rural signage such as this is all over the country, providing motivation to the labour force to work harder. 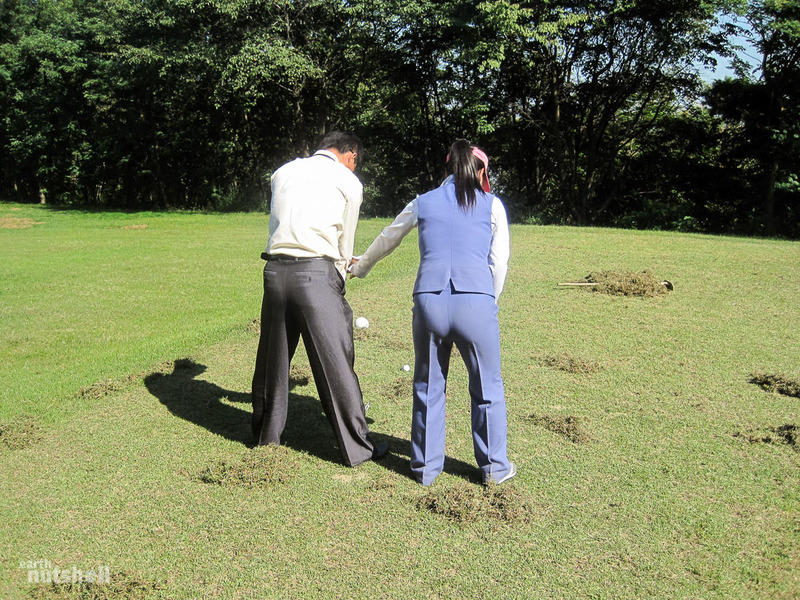 In their defence, the guides hadn’t visited Pyongyang Golf Course before. “What should we be looking for?” I was asked as we pulled the van over to where, in most countries with an infrastructure budget, would usually be a curb. I didn’t know what to say. I mean…we were searching for a golf course. You know, a giant landscaped piece of earth…mowed lawns, sectioned tee beds and pristine smooth putting surfaces with (hopefully) a flag. Possibly even a club house. But, herein lies the problem. They didn’t know. The globalised ‘gentlemen’s sport’ of chasing an arrogant white ball with a stick, the best way to ruin an otherwise great walk, the perfect afternoon excuse to escape the wife, was entirely unknown to them. In hindsight, this should have been immediately apparent when I was collected this morning at the Yanggakdo Hotel — Ri had arrived prepared for an 18 hole day on the turf wearing high heels. Bless her heart. I would have been a tough catch had I made a runner on the 15th, just saying. But in all seriousness, what a concept. National censorship at work. Caving into defeat, we began asking locals for direction. This is the last resort for KITC for two reasons: To retain a level of professional integrity but more importantly, to limit foreigner exposure to average North Korean citizens. And well, it did end up weird. Pulling up beside civilians, our simple requests were coldly ignored — we were offered in return not so much as eye contact. The locals we asked were subdued and dismissive, opting instead just to continue walking as if we weren’t there. Was it my presence? Was it the class disparity between themselves and the guides? Was it illegal? I don’t know, but in true North Korean style, the guides assured me that ‘they just didn’t hear us’. We did eventually get on track, our driver executing an erratic manoeuvre into opposing lanes of the highway which you’d sooner expect from LA police chase footage, tumbling into a hidden farmyard entrance on the wrong side of the road. Luckily there was no traffic today. Or ever. Who was I kidding? Photos weren’t permitted. 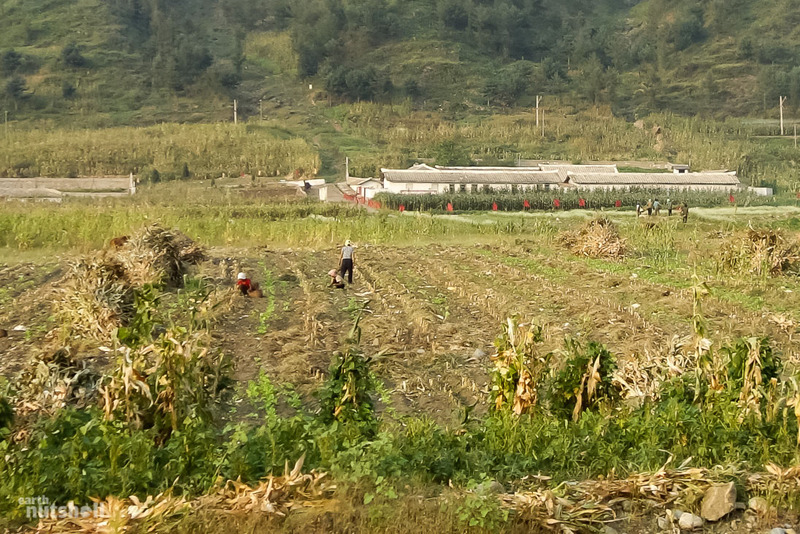 Distinctive red flags divided the landscape indicating the restrictive bounds of farm labour zones. Government order designates this work, the worker’s remuneration is provided under the nation’s ration distribution system. The road itself was merely a trail designed for bicycles; sun-dried spices brightened the edges with colour. We were the ice cream truck to the playground, only here the young children could be spotted working the fields by hand instead, looking up only to see us pass. 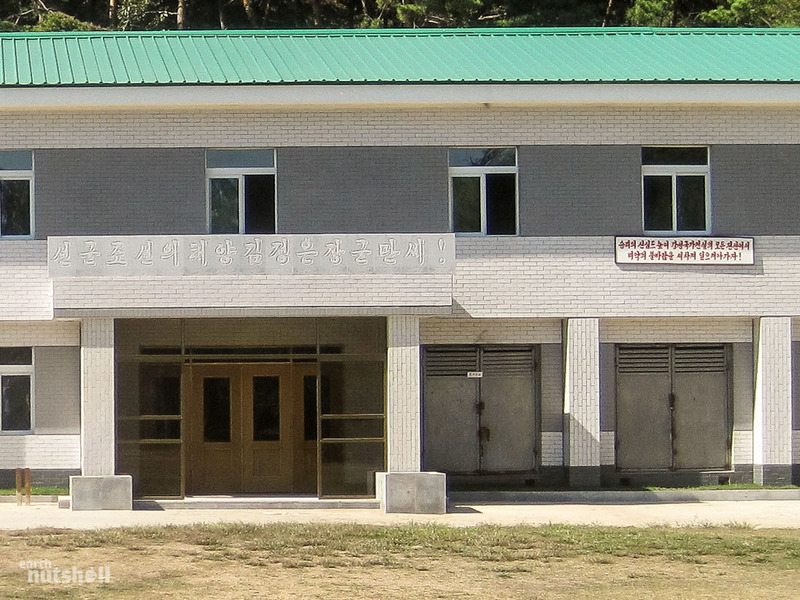 There are no modern cultivation techniques in North Korea; education is a privilege, not a right, and maybe concerns over age discrimination are taken a tad too literally. 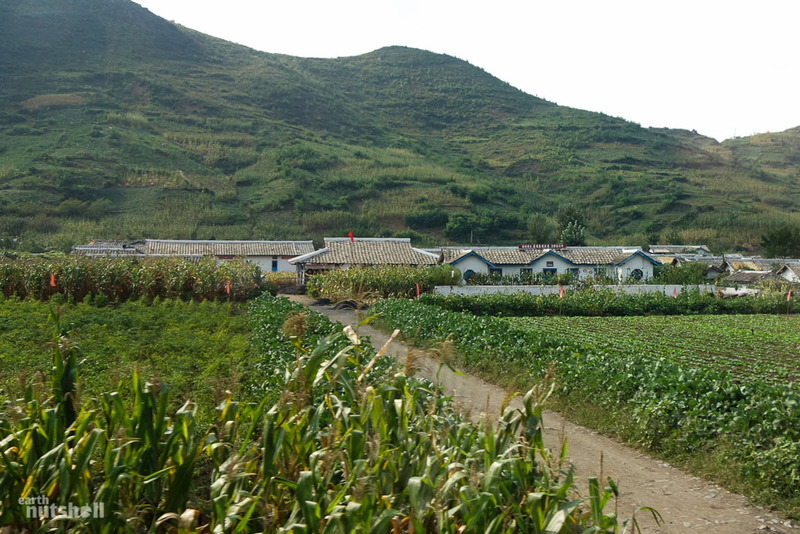 Villages were cordoned off by military blockade. 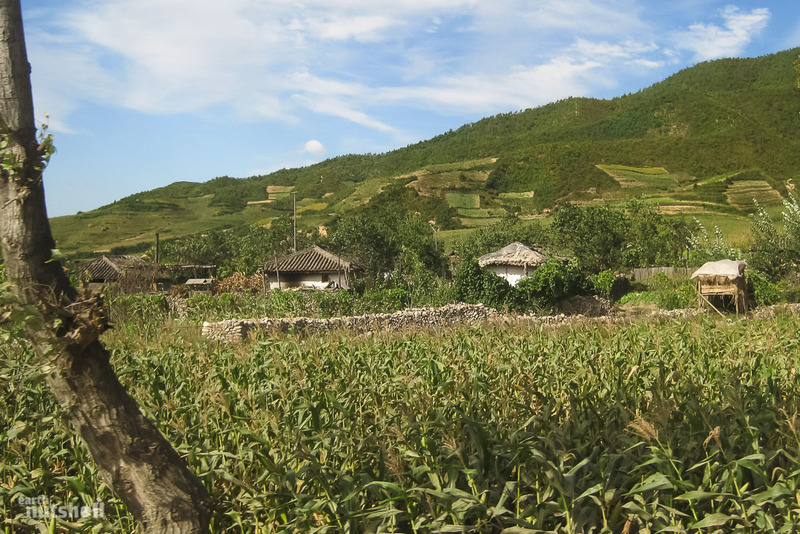 It’s worth remembering that not only are North Korean citizens unable to leave their country but for most, they’re unable to exit even the bounds of their province. These military blockades are not for foreigners. Each checkpoint is manned by Korean People’s Army soldiers, staunch and hard-line in their enforcement of authority. They’re outfitted in olive-green military attire that’s, of course, one size too big — their peak caps so tall they’re better suited to a Broadway performance. Alike a zoo gorilla, I was sized up in the vans back seat, the muffled sound of Korean heard beyond the windows, an AK-47 tapped on the drivers side levering our documentation. We handed across our papers, seemingly fulfilling all provincial entry and exit requirements and onwards we went to Pyongyang Golf Course. Blurry, this was the exact moment I was caught taking snaps out the window and firmly told not to again. 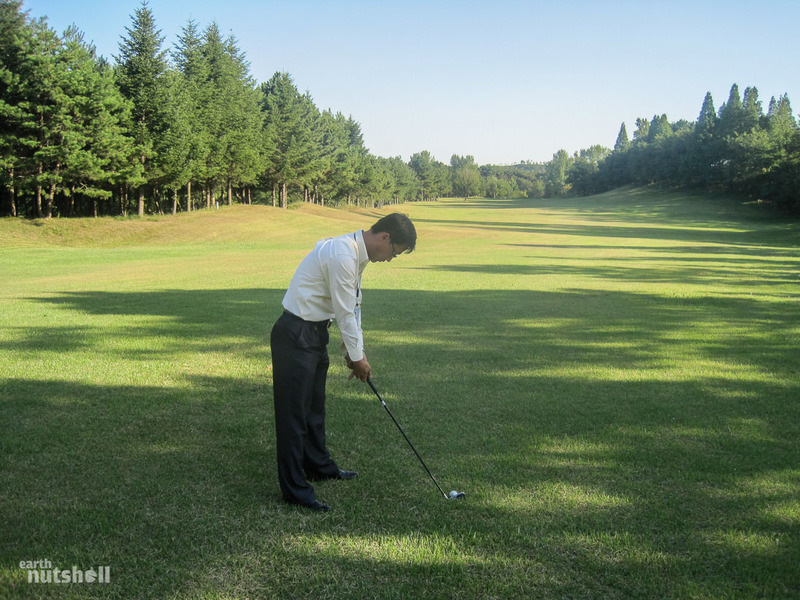 This photo was my last until Pyongyang Golf Course. There was no signage, however, it was obvious: we’d arrived. First impressions were great. I must admit I expected the worst. Trees provided a canopy to the entrance path (paved!) and manicured hedges in part formed a grand procession towards the clubhouse reminiscent to any golfer. It suddenly got a whole lot less…well, poor — I think that’s the word. Fairway views were luscious green, the roughs were distinct, bunkers raked and putting surfaces appeared inviting and devoid of plug holes. Upkeep was regular and consistent, golf courses require daily maintenance and water, lots of water, especially in this heat. It wasn’t a bad effort for a country currently enduring one of its worst droughts in history. 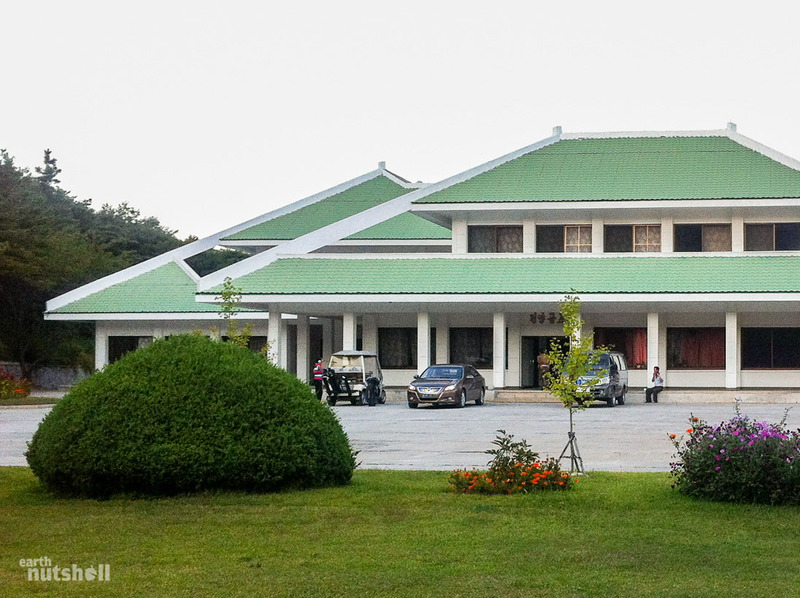 The Pyongyang Golf Course clubhouse, built in traditional Korean style. The course even owns motorised golf buggies imported from China, which I didn’t expect. The golfer pictured here had just finished their round, whoever they are, their car had North Korean plates. Marched into the clubhouse, two female employees stood clear of the door welcoming my arrival. As always in North Korea, they’d been expecting me. They spoke no English, ushering me to the front desk where a selection of battered, soulless golf shoes await that alike most of the country, hadn’t seen an upgrade since the Cold War. One pair was an ancient golf relic bearing the ‘kiltie’ – an attached frilled leather flap traditionally used to keep muck out of the laces. Today they serve more purpose attending a fancy dress party than on the course. I tried them on. They didn’t fit. I was more disappointed than I should have been. Practice putting green to the right of the clubhouse. It was surprisingly well maintained. Overall, the clubhouse was nice inside and functional, yet basic. An open plan lobby with shined stone tiles. Paintings of a North Korean holy site, Mt. Kumgang, were hung on the walls. I’d visited just two days prior and let me tell you…it was far from a dead ringer. Dusty hand carved sunken armchairs filled awkward parts of the room while closed off spaces, inviting to the curious were shuttered away in the gloom behind regally decored pastel curtains. There was even a restaurant bar area upstairs and billiards room. But most shockingly, portraits of Kim Il-Sung or his son were nowhere to be found. I felt this to be ironically unsettling. Golf balls were unbranded, so were the tees and collared shirts were on sale in just one colour, yellow — bright and happy in a country that’s anything but. Robotic smiles, the faces of excessive service led me into a course credit line, sending me bounding toward the first tee with a bucket of Heineken (imported from China), DPRK bottled water and lousy canned coffee. Legally, I had to be chaperoned around even the golf course today. There was just no respite! An overview to the course at the payment desk inside the clubhouse. Concrete lettering: “Magnifying the devotion of victory, let’s create a violent blow of fire wind on all fronts of the rigidity nation building!” Red lettering: Long live the son of Songun (Military-first ideology) Chosun, General Kim Jong-Un! Now, for the golf clubs. What were to be today’s North Korean weapons of choice? According to cultural differences, this may well just be a bag of Kalashnikovs — golf here could be different than I envisioned. Either way, I was worried because I suffer the dreaded left-hander handicap, only golfers reading this will understand the struggle. I’d told them prior, but was still convinced of imminent forced ambidexterity. I kid you not, that’s a left-handed American Callaway 10° Great Big Bertha II. In North-bloody-Korea. You can also spot a Japanese PRGR Titanium 15° Fairway Wood, even a late 70’s 4-wood endorsed by American pro golfer Arnold Palmer. But, the icing on the cake was the bag itself, one of ‘Firestone Country Club’, an American private golf course located in Ohio, a regular stop on the PGA tour. How a bag of theirs ended up in Pyongyang is anyone’s guess. Hey, capitalism isn’t so bad after all. To any golf aficionados reading: The set of irons were branded ‘Marcus’, each club with their own, individual alphanumeric model number. I’ve never heard of this brand, and neither has Google — if anyone can shed any light on this, leave a comment, I’m most curious. 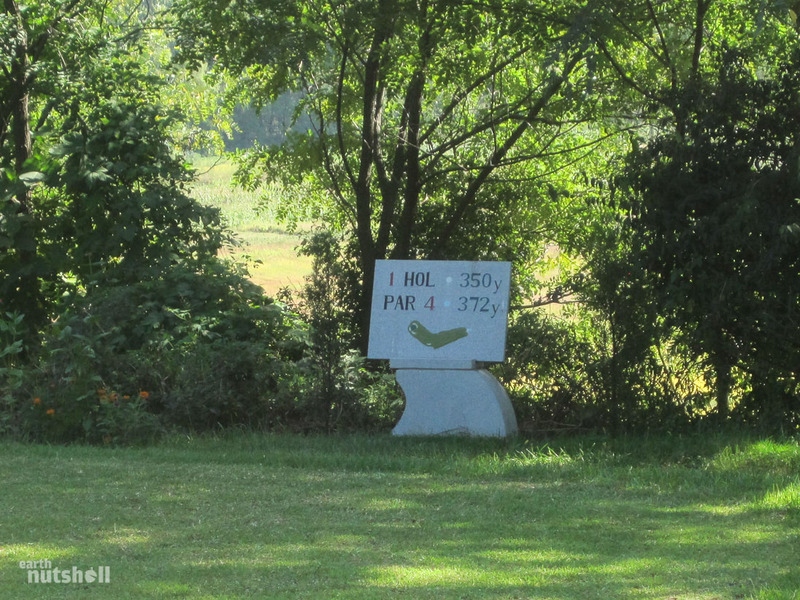 The first hole tee-bed signage. The caddy and I on the first hole tee-bed about to hit off for the day. Facing me up the 1st fairway was a sharp dogleg to the right, to a left-hander with a tendency to duck-hook it was my dream tee-off to begin the day. Perfect. 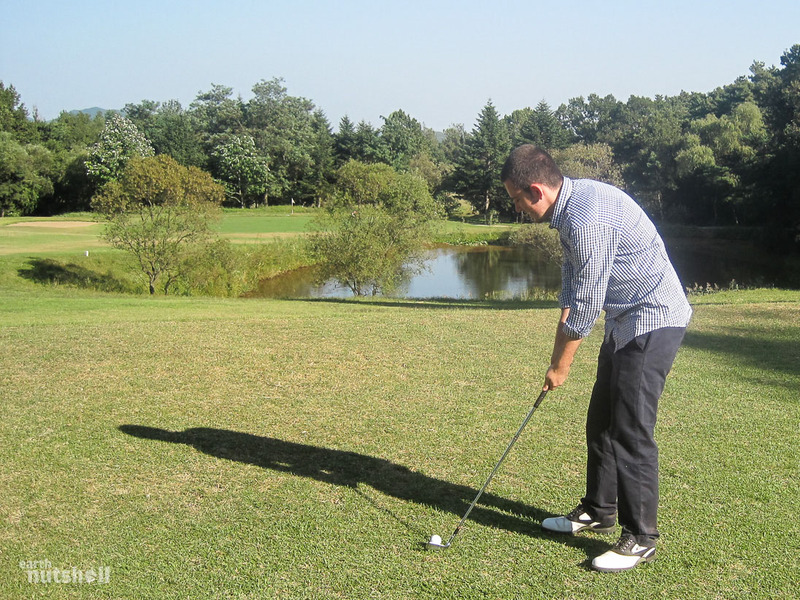 The Callaway felt comfortable, the cool breeze carving off Lake Taicheng onto my face as I lined up my drive with a mouthful of ice-cold Heineken. So, with the world at my feet and an eager gallery of North Korean minders, I took this confidence and flogged the days opening shot, shanking it straight into the North Korean pine forest to the whipcrack of snapped branches — an all-expense paid safari. “Oh no…” The caddy remarked timidly, reaching for another ball. 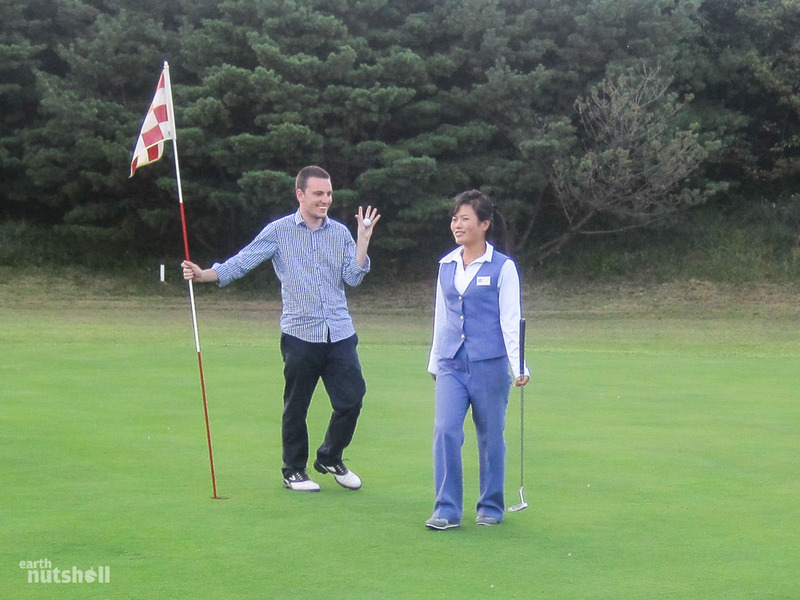 And that my friends, is the story of how I introduced our beloved game of golf to two more residents of Pyongyang. 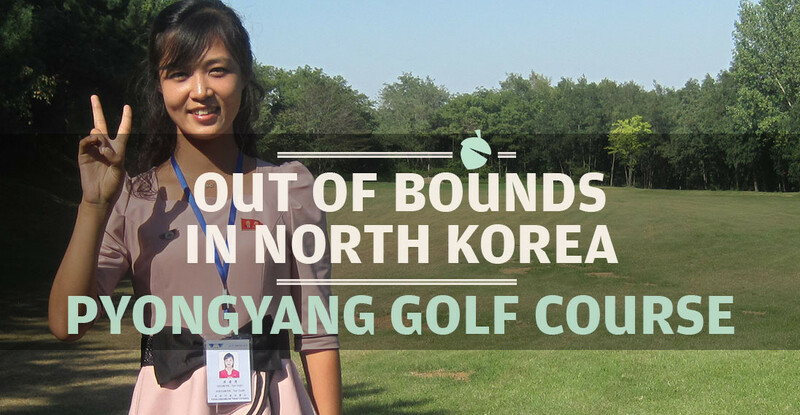 Out of bounds in North Korea, a shot hit badly enough to be punishable by labour camp, somehow the guides never shied away, instead welcoming yet another ruleset into their lives. Demonstrating the role of each club, I crunched my 4-iron recovery shot straight towards the green to a round of traditional golf claps. Hey, I’d visited North Korea to ask the questions, now I found myself in the hot seat taken aback by the guides’ genuine curiosity. Without a fundamental understanding of golf, it isn’t much of a spectator sport, I’d anticipated dragging each guide by their collar, both bored with sore feet just as two children kicking and screaming to leave the supermarket. Having a laugh with Kang, walking between tees. With looks of inspired uncertainty, Kang jumped at the opportunity only to be shot down as a right-hander and well, Ri had as much clue of her preferred side as she did logging into a Gmail account. Fortunately (unfortunately?) 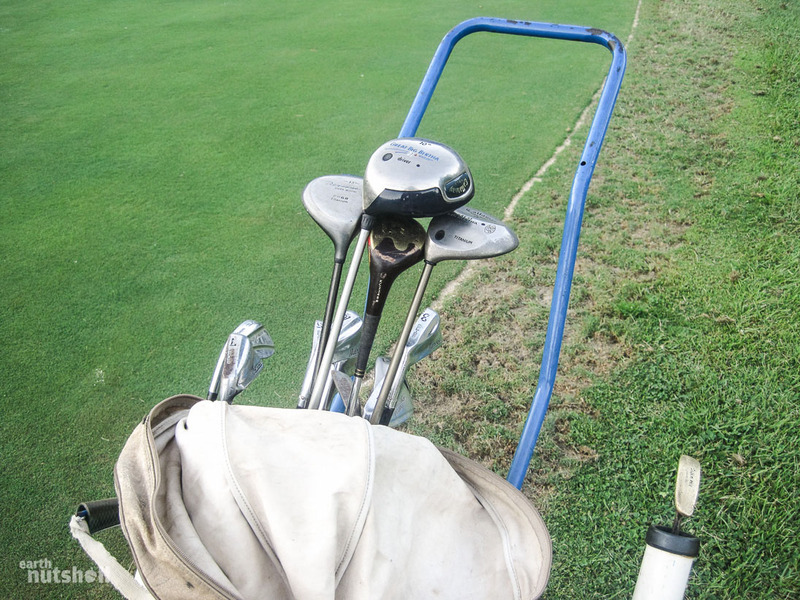 for them today, I had a little something I prepared earlier, a deviant plan that saw the right-handed 7-iron and fairway wood of another set weasel into my bag, just in case. And well, with the power of peer pressure, the caddy and I were now operating a North Korean golf clinic. This is Kang taking some practice swings under the guidance of our caddy. Ri being a great sport, taking her first ever golf shot. It turns out she was left-handed after all. Her shot went 300 yards, and she followed it up with a hole-in-one on the 7th. What? Prove me a liar, I challenge you! 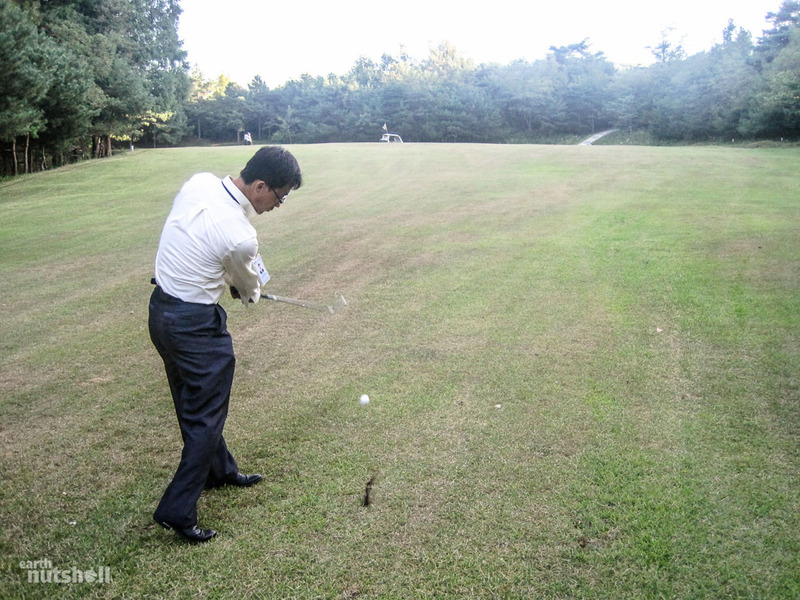 Kang took a particular liking to golf, firing off balls in quick succession to hasten his mastering of the basics. Into the water, into the pine forest, ground grubbers — he didn’t discriminate, reloading until empty before hurtling down the fairway in a sprint, defying golf etiquette to collect the few that went straight. He was enthusiastic, golf clearly resonated with him and his improvement over the next few holes was staggering. “What other sports do you play, Kang?” I asked, curious to his ability. “Football, basketball and volleyball, but only when I’m not busy with tours.” he replied. I understood what this meant. Not the weekend, not the national holidays nor his days off, but once in a blue moon. North Korean tour guide is an endeared, respected profession — cracking Foreign Language University in an exiled nation is an exclusive club, expectations were back-to-back tours, seven days a week, even if you’d just spent sixteen days on the road. Today was a special treat. “On occasion, I’ve played basketball against tourists too. But, I haven’t met anyone that’s ever played golf before. I like the sports focusing on hand-eye coordination, the only problem is that I’m very competitive.” He added. I’d witnessed sport all over North Korea, from Pyongyang’s privileged few dribbling imported orange basketballs across well maintained public courts, rural outsiders competing at volleyball in netless gravel yards, to those in extreme poverty making do with plastic bottles as makeshift soccer balls in the street. It’s always one of those wake-up calls that we weren’t so different — mutual enjoyment of sport knows no boundaries, and today for me, gone were the political and cultural contrasts and what was left was an Australian and a bunch of North Koreans on a sunny day indulging in some recreational golf. Kang taking his first ever golf shot. It’s a tough sport to grasp initially, just ask my friends back home. Kang certainly surprised me with his ability. 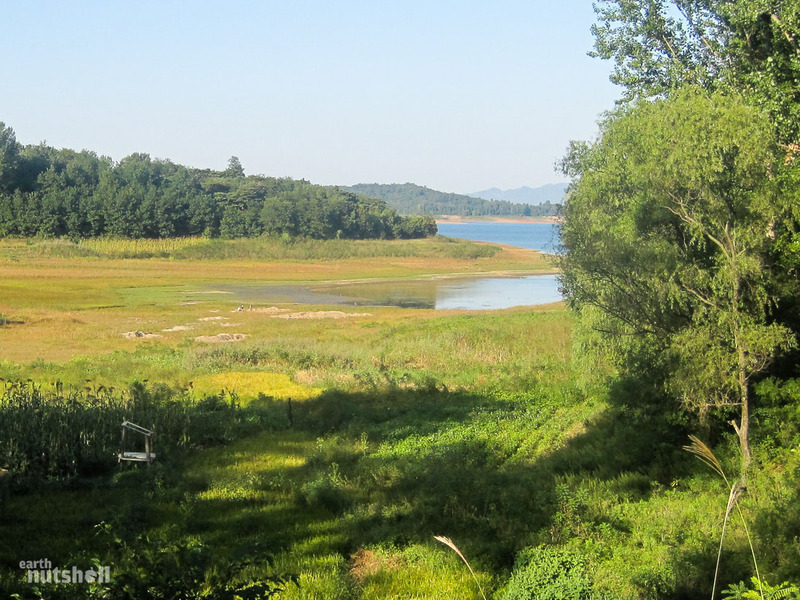 Holes 1 to 5 of Pyongyang Golf Course were positioned on a peninsula extending into the landlocked Lake Taicheng, and each one had tree line water views. I found this intriguing as I’d been told prior to arrival that photography on these holes was prohibited and strictly enforced, that I’d have to wait until the 6th. An odd rule, I thought, until I discovered the (hard to believe) reasoning — Kim Jong-Un’s luxury yacht. This secluded area within arms-length of Pyongyang city is apparently a holiday getaway for not only Kim Jong-Un himself, but his late father in the past. Each enjoyed sailing their multi-million dollar boats on this relatively small, inland lake that has absolutely no access to the sea. Sounds ludicrous right? Too weird to be true? Just another North Korean myth? 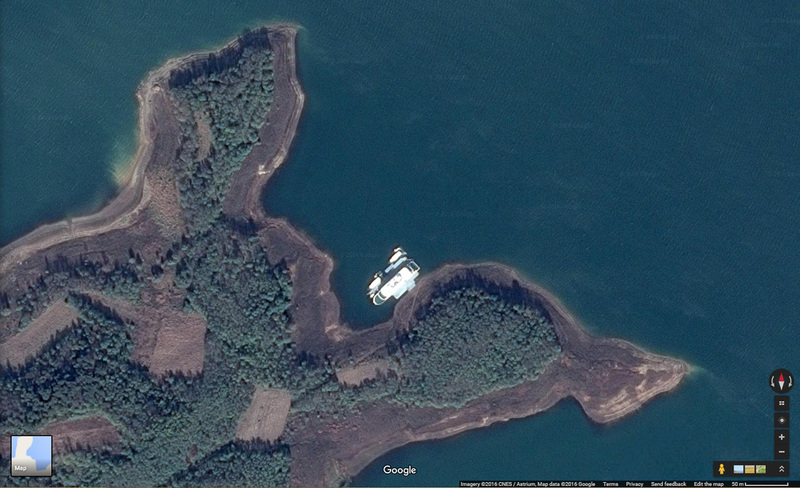 Check the screenshot below of Lake Taicheng from Google Maps and decide for yourself. That’s unmistakeably a luxury yacht, closer resembling a luxury cruise liner if you ask me, just sitting there in the lake like a rubber duck enclosed in a small bath tub. 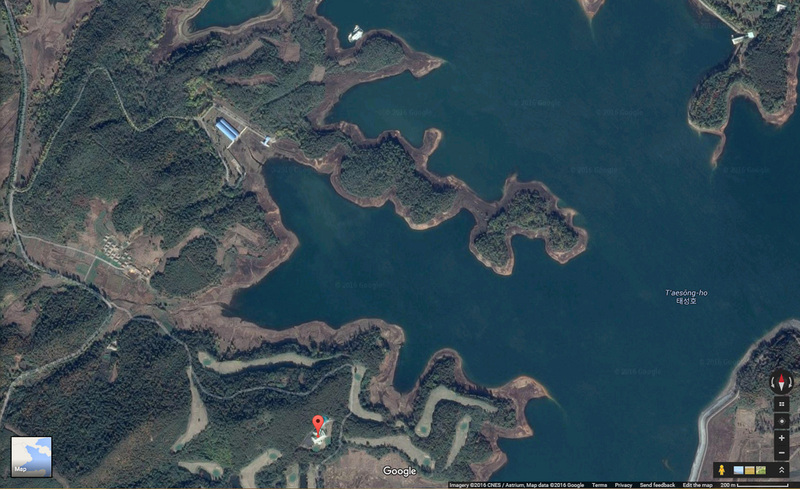 Here it is relative to Pyongyang Golf Course, you can see the course on the peninsula at the bottom, the boat is just off centre at the top. To the far right, you can see what appears to be a small jetty that leads up to a set of building complexes, take a look at Google Maps — could this be one of Kim Jong-Un’s rural palaces? The findings of mapping project ‘North Korea Uncovered’ seem to agree. 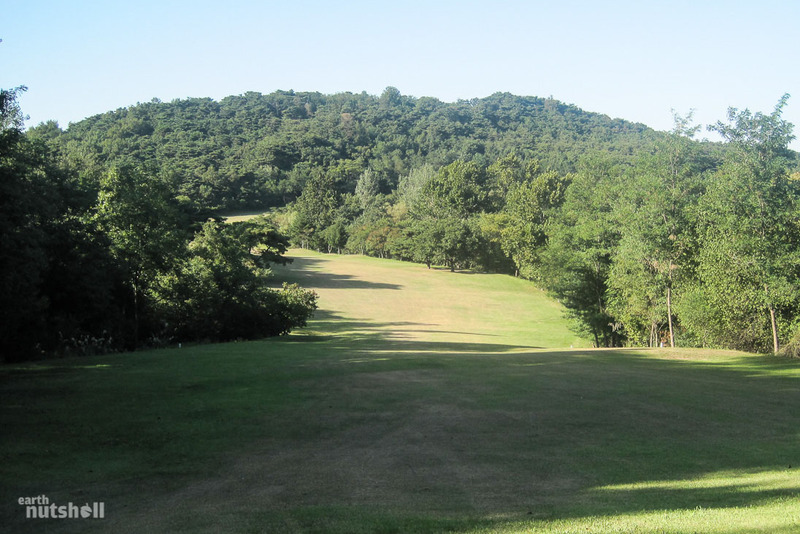 Here’s an example of the view from eye-level heading up one of the fairways. You can see people down near the water working in a mud hole. I have no idea what they were up to. Settling into my next drive on the 5th, the (initially shy!) caddy, at a volume unsuited to her physical frame, bellowed Korean down the fairway warning all greenkeepers into the pines. Wearing wide-brimmed sun hats and scarves, knelt with plastic bags by their patches of hand-maintained rough, each stood and stared like deer in headlights only to scurry off out of sight. I argued that they’d be safer straight down the middle. Laughing, the caddy relaxed her strictly professional demeanor, opening up to the guides. “She said you are the first foreigner she’s come across that’s wanted to play the entire course, 18 holes. She thinks you will be very tired,” Ri translated. Looking around, if it were a movie, there’d be atmospheric crickets. The course sat vacant. We were the only occupants of the 6200-metre grassland complex. “Foreigners don’t often visit, she says, other than some regular Chinese players. She’s never caddied an Australian before, she thinks you are a fantastic golfer, the best she’s seen so far!” Ri added, giggling. Not one to dismiss a compliment, I felt she’d overused her creative license here. I’d be more inclined to believe Marshal Kim Jong-Un was sponsoring a portfolio of sick children in Africa than that claim. “Have any professional golfers visited Pyongyang Golf Course?” I asked. I’d long wondered the answer. “Aside from me, of course!” I snuck in, jokingly. Nodding, smiling, her eyes glowed before ringing off what sounded like a list of Korean names. Ri repeated many, confirming my suspicions and asked if I had heard of them. “Are those North Korean golfers?” I asked, innocently. “Yes,” she replied, nodding once more. There’s been no recorded North Korean professional golf players in history. Met with a confused look of indifference followed by bewilderment when the name didn’t ring any bells, we continued to the 7th hole. The par 3 7th hole over a water trap. — “Kim Jong-Il apparently hit an amazing round of golf here at Pyongyang Golf Course, only 34 shots, have you heard about this?” I asked the caddy. Well, for a tale dividing many between either North Korean ‘fact’ or Chinese whisper of pure Western fan-fiction, this was an intriguing response. Seemingly in agreement to its potential legitimacy, whether she was aware of this feat only as a result of prior tourists perpetuating the myth, or from it having a genuine origin within North Korean propaganda, I can’t confidently say. Either way, it’s recognition here indeed breathed life into what I presumed prior to being a homeless dead horse. But by any measure, the infamous fable had single-handedly propelled Pyongyang Golf Course onto the international stage. Honestly, it felt surreal to be playing at the source, like an illusion, as if I expected something supernatural despite how irrational that sounds, for my expectations to be met. But no, upon striking the ball it simply clinked off the club head, divot kicking into the air, the ball sailing wayward into the bushes just as it did in Australia, or anywhere else. It wasn’t all play and no work. Kang pictured checking in back at Pyongyang using his mobile phone. The back 9 was more mechanical than the front, most holes were less inspiring, they were long, straight and inset away from the lake in the heat. It was no Pebble Beach, it wasn’t going to win any design awards, but Pyongyang Golf Course was still quite a challenge. We spent these holes mostly chatting, hacking at the fairway as an aside. We discussed life in Pyongyang, the guides’ upbringing and education, hobbies, movies and music, even as far as technology, stopping only at politics or any sensitive matters as these sorts of questions were forbidden; best case it’d make them uncomfortable and worst case, it could land them in trouble. Nonetheless, scratching the surface was a great insight into the Pyongyang elite. It’s hard for me to explain to you. To talk to a group of people that have collectively never watched Pulp Fiction. Crazy, I know. But, in all seriousness, it’s quite remarkable. On one hand, you have well-educated, privileged and relatable guides living within the most advanced city of North Korea. On the other, these same people are missing an entire section of ‘knowledge’ that we Westerners have otherwise, namely recognition of global branding and pop culture. North Korea is technically the only country in the world without Coca-Cola and nobody has ever tasted a Big Mac. Nobody has ever heard of Google, or made an electronic payment with a Visa or Mastercard. North Korean men are amongst the most prolific smokers on earth but Marlboro is out of reach. What are The Simpsons? The Beatles or Elvis Presley were people that have never existed; I wish I could rediscover Tupac Shakur. And, well: “My friends and I in Australia usually organise our events on Facebook.” You’d better begin by articulating the concept of Facebook, how we access it on our Apple iPhones and then share photos over uncensored 4G networks. It’s quite easy to trip over during conversation. Orchestral music, primarily female vocals, appeared to be the most popular music between the guides. Interestingly, they’d watched Monsters Inc. and Finding Nemo legally. 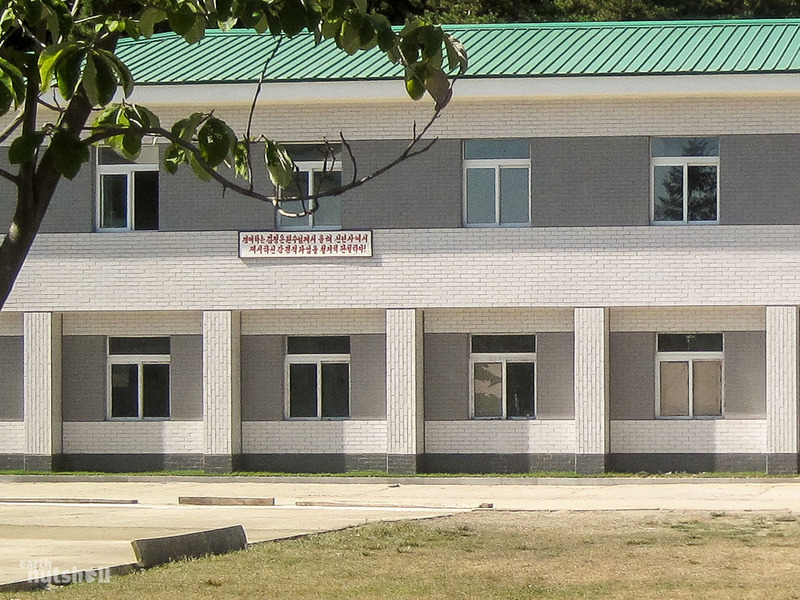 Many sterile and lightly themed international movies are used in Pyongyang’s Foreign Language University as learning tools and man can be purchased at DVD booths on the streets of Pyongyang, pirated at a State level by Mokran Video Company. I’d come across guides that spoke German, Chinese, Russian, French, Danish and even Vietnamese just for tours. These students had never before met a native speaker outside tours and will usually never be allowed to visit the languages native country. One of the countless greenkeepers maintaining the course by hand. Better than putting on a furry rug, the green quality isn’t great, yet better than I expected, not far off rural public courses in Australia — just with a higher price tag! Ri didn’t own a camera, so I let her commandeer mine for the last handful of holes. She took a lot of photos, including many of the photos you see here today (Thanks, Ri!). Multiple phone calls were made as we played the course, presumably back to Pyongyang. I don’t know why, I wasn’t going to ask either. Mobile phones were common in Pyongyang and other major cities. Mainly ‘bar’ phones, but I’d also spotted flip-phones, even touch screens. Apparently they run legally on a heavily censored internal network named ‘Koryolink’ that has disabled both Internet access, and international calls, unsurprisingly. The feeling I got was that this kind of censorship was common knowledge to those in Pyongyang. Throwing a spanner in the works, I asked the guides if they were aware of international current events. 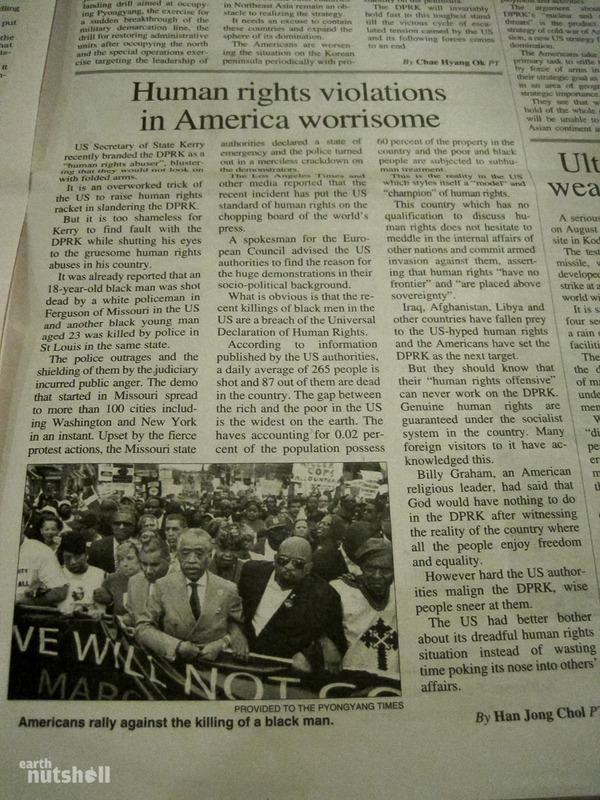 They were all aware of the Ukraine Crisis, the Arab Spring and even the Ferguson unrest in the United States — world events are covered in their local newspaper, The Pyongyang Times (albeit in an interesting manner), a daily paper that would put even CNN’s agenda to shame. Oh and apparently it’s true that by law, each residential home is required to have portraits of both Kim Il-Sung and Kim Jong-Il hanging from the wall. “Look, pheasant!” The guide interjected, changing the topic and misdirecting me away from yet another group of manual labour picking at the rough. Ri enjoying her round before sinking into the turf thanks to the high heels. To the 18th. The final hole to the Cold War’s final frontier. The day’s precedent had long been set and I finished with an anticlimactic bogey thanks to a 3-putt I’m still upset about. I’ve got to do something about those knee-knocker 4-footers. I keep telling myself that. Anyway, what a day. I’d lost more balls than I’d made pars, the course itself hadn’t been particularly impressive, it was an expensive round, there’d been snakes, and it’d gone considerably overtime. But, it was a round of golf I’ll never forget. We’d had a blast. Good old fashioned fun. In North Korea, where fun wasn’t a word. Ri had discovered she was in fact, a left-hander and Kang had added another sporting love to his repertoire. The caddy had met an Australian. And I’d shown her that we too, were just as bad at golf. There’d been laughter, banter, but most importantly a deeper interaction than I’d otherwise had during the stringent, well-dressed ‘façade’ of North Korea’s take on Pokémon Snap, an organised, government sanctioned tour. Monuments to Kim Il-Sung had been intriguing, his old age facility fascinating, the Metro Museum bizarre and the Demilitarized Zone’s fake wall perplexing, but to none of these I could comfortably attribute the word ‘fun’, until today, with Pyongyang Golf Course. Showing off my first and only birdie of the day on the par 4 15th. 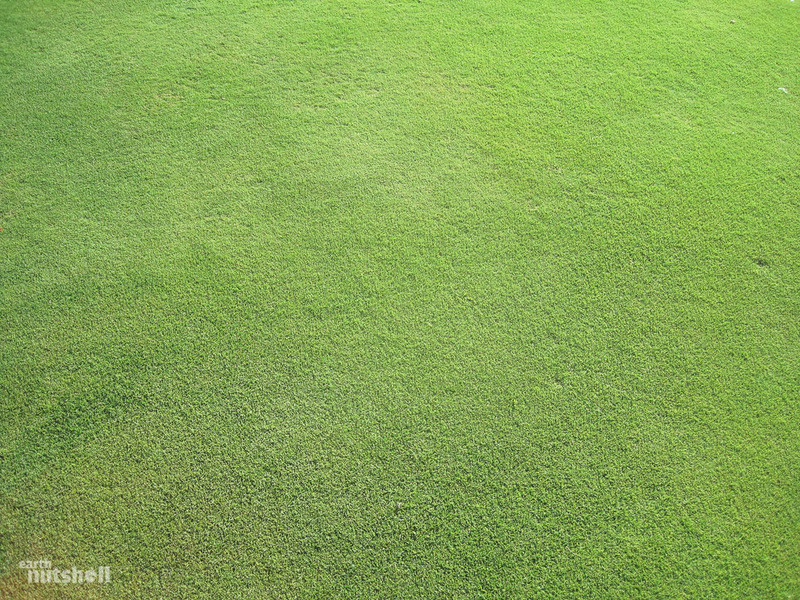 Dead centre of the fairway where your ball is likely to finish up. I nickname it the moneymaker. Twilight had set in, and the course sprinkler system had turned on to give us a friendly prod back to the clubhouse, just as I’d fired my last approach shot too — I’ll blame the bogey on that. “Did you enjoy yourselves?” I asked the guides. She’d made similar comment today after each cleanly hit iron stroke, motioning the flight of the ball with her arm, the kind of shot that sounds and feels great off the hands and which goes sky high towards the green and lands with an enticing thud. 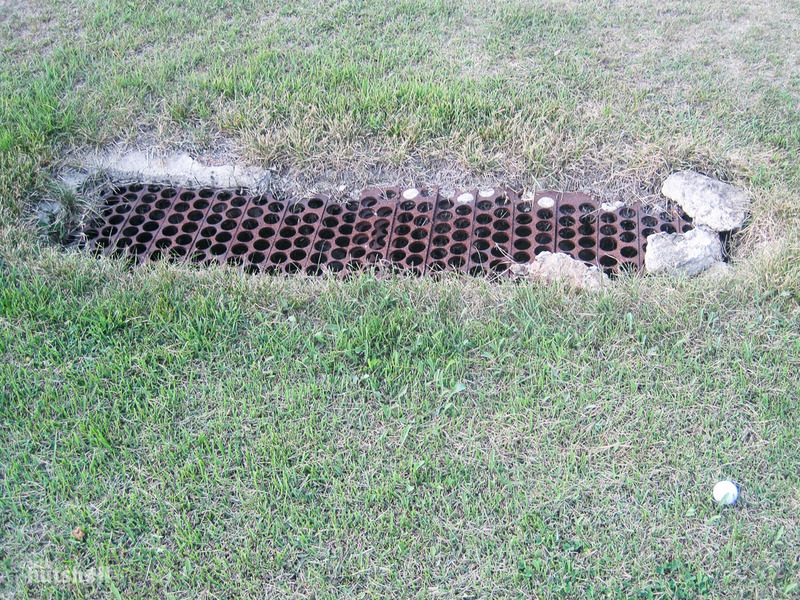 It’s a golfers kryptonite. Yes, it was relaxing. She ‘got’ it. Either that or Ri simply enjoyed stressless days at work and long walks on the beach. Don’t ruin it for me. Kang walked over, shook my hand firmly and thanked me, “It was great. I hope to play golf again soon,” he replied, expressing his gratitude for today’s induction. — After today, It was unlikely Kang would ever get the opportunity to step foot on a golf course again. Action shot, look at that form. Kang went from air swinging to transferring his weight and taking a divot within less than 18 holes. Dusk fast approaching, the invisibility cloak granted by the darkness was analogous to our uninterrupted, peaceful day frolicking woodlands without control or scrutiny, we packed it in and shuttled back to ‘normality’, Pyongyang, North Korean central control, totally offsetting the freedoms I’d savoured today. Military checkpoints reappeared, frozen in time just as prior. 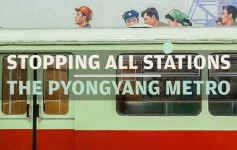 Kim Il-Sung’s static, photogenic grin began to emerge, murals illuminated alone to a backdrop of ghostly Soviet high-rise silhouettes while eerie revolutionary music cut through the spotless, curfewed streets near flag-draped sites of national importance. My stop at the Draft Beer Hall was cut short after ‘illegal’ photos I’d taken inside, and the questions now asked of my guides redefined ‘politically correct’ closer to that found inside George Orwell’s timeless classic 1984 — surveillance in Pyongyang is similarly culturally instilled. Dinner was segregated alone, a table for one in an empty restaurant — three waitresses, ten plates of food and a seat facing North Korean State Television, Kim Jong-Il was shown inspecting agriculture productivity four years beyond his death. Fittingly, my day ended where it began, Pyongyang’s very own ‘hotel Alcatraz’, the island-isolated Yanggakdo International, where I’d be imprisoned for one last night. The hair we’d let down on the golf course had now been pulled back into a neat, compact bun, so to speak — Pyongyang meant business as usual. Bunkers no longer innocently meant the golf trap filled with sand. A day on Pyongyang Golf Course was a day I almost forgot I was in North Korea. thnak you for the article, I play golf in California, and I always wanted to play in north Korea, I enjoy the article and pictures I have printed the score car d and I am going to to translated to yardage. can you please send me information and cost . More more MORE !!!!! Please i love all this dprk stuff great long read but more! Go again as i can’t….. American….